For two decades, soprano Mary Dunleavy has been best known for her Violetta in La Traviata, a role she has sung with companies including the Metropolitan Opera, San Francisco Opera, Gran Teatre del Liceu, Beijing’s National Centre for the Performing Arts, The Nederlandse Philharmonisch Orkest, Glimmerglass Opera, New York City Opera, Atlanta Opera, Opera Theatre of Saint Louis, Lyric Opera of Kansas City and others. In recent years, Mary has added roles to her repertoire including her critically-acclaimed Christine Storch in Intermezzo with Garsington Opera and NYCO; Alice Ford in Falstaff with Garsington Opera and Opera Omaha; Mimi (Fort Worth Opera) and Musetta (Metropolitan Opera, Opera Omaha) in La Bohème; Desdemona in Otello with Nashville Opera, and Cio-Cio-San with Chautauqua Opera. 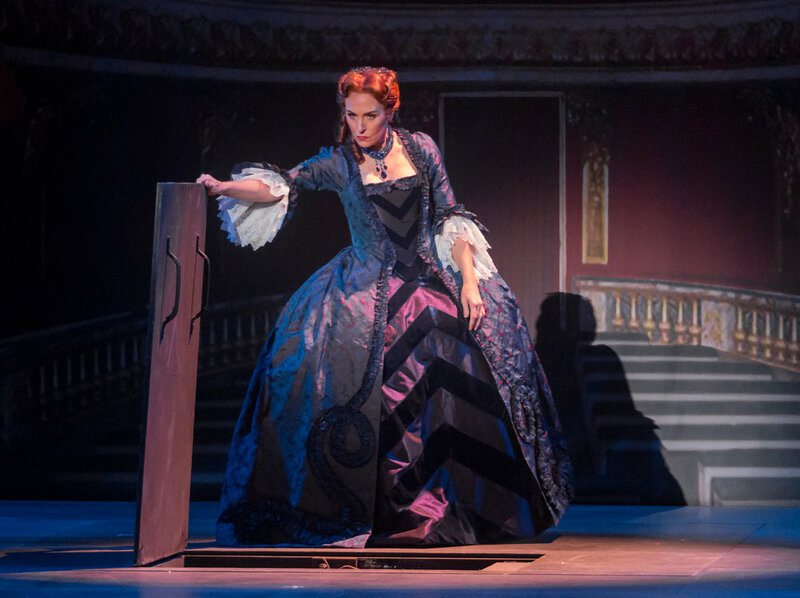 She was the the Stepmother in the North American premiere of Alma Deutscher’s Cinderella at Opera San José (available on DVD from Sony Classical) and created the role Millicent Jordan in William Bolcom’s Dinner at Eight with Minnesota Opera and Wexford Festival Opera. These are in addition to current Mozart roles including Pamina in Die Zauberflöte (Metropolitan Opera, Portland Opera, Boston Lyric Opera); Donna Anna (Michigan Opera Theatre) and Donna Elvira (Portland Opera) in Don Giovanni; Fiordiligi (Opera Philadelphia) and Despina (Portland Opera) in Così fan tutte, and Countess Almaviva from Le Nozze di Figaro (Opera Philadelphia). Mary’s current French repertoire includes Micaëla in Carmen (Metropolitan Opera, Netherlands Opera, The Dallas Opera, Pittsburgh Opera), Marguerite in Faust (Opéra de Montréal, Atlanta Opera, North Carolina Opera, Opera Birmingham), the title role in Thaïs (Opera Theatre of Saint Louis), and Antonia in Les Contes d’Hoffmann, a role she has sung with the other Hoffmann heroines at the Met, The Dallas Opera and Connecticut Opera. Gilda from Rigoletto was another staple of Mary’s early career, with performances at the Metropolitan Opera, San Francisco Opera, Hamburg State Opera, Teatro Municipal de Santiago, Lyric Opera of Kansas City and Opera Pacific. She won accolades early on as the Infanta in Zemlinsky’s Der Zwerg at Spoleto Festival USA and Rome Opera, a role she reprised fifteen years later to critical acclaim with James Conlon at The Philadelphia Orchestra and Los Angeles Opera (available on DVD from Arthaus). Bel canto roles from that time included the title role in Lucia di Lammermoor (Opéra de Montréal, Connecticut Opera, Knoxville Opera); Norina in Don Pasquale (Opera Theatre of Saint Louis, Virginia Opera); Adina in L’elisir d’amore (Teatro di San Carlo, Portland Opera); Amina in La Sonnambula (Bilbao), and Giulietta in I Capuletti ed I Montecchi and Countess Folleville in Il viaggio a Reims at NYCO. Other earlier performances included Leïla in Les pêcheurs de perles (Seattle Opera, Opera Philadelphia, Opera Theatre of Saint Louis, Opera Colorado, NYCO); Héro in Béatrice et Bénédict (Netherlands Opera); Ophélie in Hamlet (Gran Teatre del Liceu); Adele in Die Fledermuas (Opéra National de Paris); Regina in Mathis der Maler with NYCO, and Juliette in Roméo et Juliette and Baby Doe in The Ballad of Baby Doe with Connecticut Opera. Mary’s orchestral appearances have included: Beethoven's Symphony No. 9 with the Atlanta Symphony, (available on Telarc, Donald Runnicles conducting), the Teatro Municipal de Santiago, the St. Louis Symphony, the San Diego Symphony, the Austin Symphony Orchestra and others; Mozart concert arias with the St. Louis Symphony under the late Hans Vonk and Handel's Messiah under David Robertson; Britten’s Spring Symphony with the San Francisco Symphony under Robert Spano; Carmina Burana with the Philadelphia Orchestra under Charles Dutoit; Mahler's Symphony No. 8 with the New York Choral Society; Mahler's Symphony No. 2 with the Buffalo Philharmonic Orchestra under JoAnn Falletta; at the Lanaudière Festival singing a selection of arias with the Orchestre symphonique de Montréal under Jacques Lacombe broadcast on the CBC, and then later a concert of duets with Jennifer Larmore and Les Violins du Roy; and with the Los Angeles Philharmonic under Leonard Slatkin at the Hollywood Bowl singing Mozart arias in Amadeus Live, a performance of scenes from the Peter Shaffer play. Mary was born in Connecticut and raised in New Jersey. She received her undergraduate degree from Northwestern University, where she studied with Kathleen Kaun. She earned her Master of Music degree at the University of Texas at Austin, where she studied with Mignon Dunn. She has been named the Maria Callas Debut Artist of the Year by the Dallas Opera, an Outstanding Young Texas Ex by the University of Texas, is the recipient of the Cultural Award from the American-Irish Historical Society and has twice been named to the Top 100 List of Irish America Magazine. Mary has studied with teachers and coaches including the late Rita Shane, Nikki Li Hartliep, Renata Scotto, Hank Hammett, Dale Dietert, Thomas Muraco, William Tracy and Ron Raines among others. Her own students have performed leading roles with Glimmerglass Opera, Utah Opera, Portland Opera, Des Moines Metro Opera, Chautauqua Opera, Theater Aachen, Garsington Opera, Royal Academy Opera, Guildhall School of Music and Drama and others.